During the hurricane ordeal I found this little guy. At first I was going to just house him until his broken leg healed. Then I was going to return him to the wild. Then I caught him and started watching him for over a week., And I thinmk his back has been broken. . He gets stuck in the upside down position alot. His body twist and bends in half. And when he walks he drags both hind feet and tail using only his front feet. I hope he heals but I tink he may be paralyzed. He doesn;t seem to feel thing on his back end. Anyways, I havent socialized him to humans incase he starts getting better. If he doesnt show improvement I will keep him. Anyways therre was his story and herre is his pics. 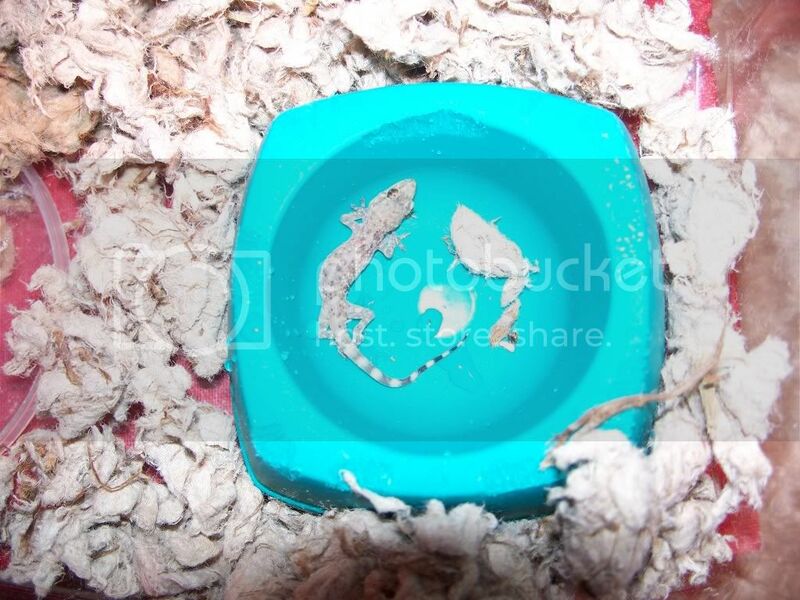 This is him inside of a small mouse food bowl. Ive done alot of reasearch about them already but if anyone has any tips Id love too hear them. I gave him crickets but they hurt him. (took some skin off) so I am only feeding him under supervision now. I tried to catch bugs and whatnot. So if anyone knows of any harmless easy to catch/buy bugs please let me know. They do have to be alive for him to eat them. 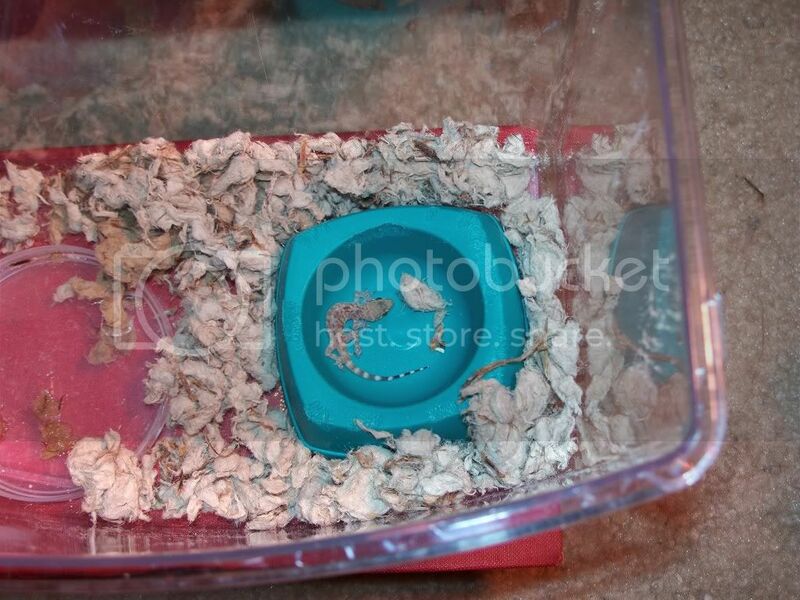 I was told that I can give them meal worms but I wanted to ask you guys about feeding meal wroms to geckos first. (this is where the experts live) lol. Awww...he's cute. I would watch him and if he can't use his leg them keep him,otherwise if he seems to be in pain take him to a vet to have him PTS. I would take him off the Care Fresh (I think that's whats in the pictures) and put him on something like dirt or eco-earth/coco fiber.And add a hide. Feeding him:Try using tweezers and hold the cricket in front of him or giving him small crickets,also provide food for the crickets in the tank. Meal worms should be fine to feed him,assuming he's big enough. Yeah,he looks like a common house gecko. I GOOGLED 'common house gecko' and he does resemble them. I'll try to find some info on him. Since you have him, does he match any of these close up? Yeah he looks like some of the pictures in that link. He does change color a little bit here and there. He's changing color more frequently then what he did when I first too him in. Thanks for the information site url. It helped alot. 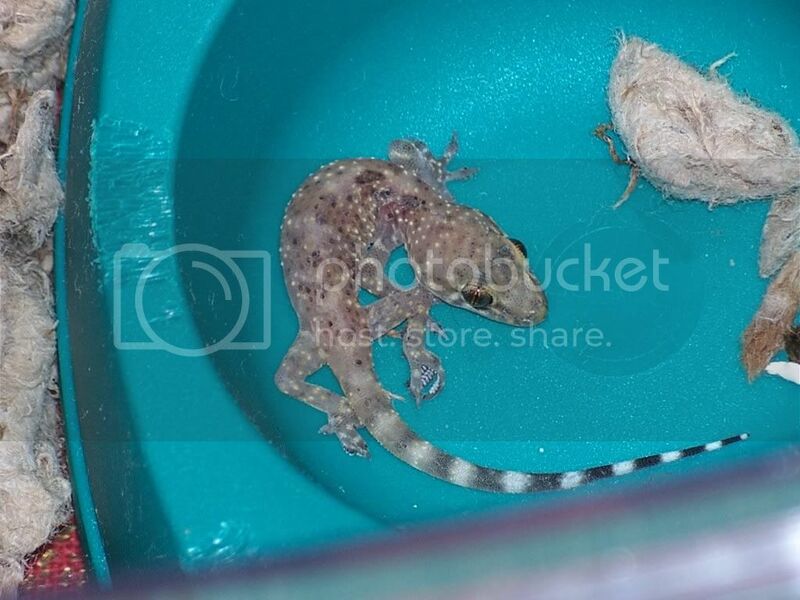 I have another question though when I get a Calcium/Vitamin dusting Supplement, do I drop the insects in the dust and then feed them to the gecko or do I put it in his water? Anyone have any reccomendations on a good supplement? Thanks again for allo the help. You want to dust the crickets or whatever your feeding in the calcium.